Researchers at the Indian Institute of Science (IIS) designed a device based on graphene and metal nanoparticles that shows a significant response to light and is colour sensitive. This may be greatly beneficial for applications like ultra-sensitive photodetectors and efficient solar cells. The scientists display a device with a large number of stacked silver nanoparticle pairs, all separated precisely by just one-third of a nanometer using graphene. All light interaction related properties are found to be enhanced in this unique device structure. The graphene acts as a perfect spacer and this produces an unprecedented field enhancement of nearly a million times in between the nanoparticles, boosting the interaction with light. As a result, the Raman signal in this device was found to be 100 times more intense. This is of significance because although graphene responds to a large range of light frequencies (colours) and has a very fast response, it does not absorb light very well by itself. 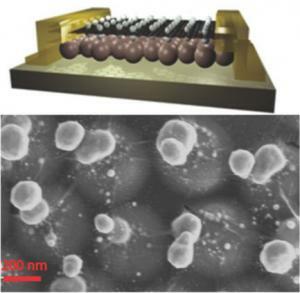 According to the scientists, this design can be extended to other materials as well and allow use of a variety of plasmonic (metal nanoparticles) and 2D materials, which can be used to make devices of novel functionalities. The researchers are already looking for industrial partners to take this technique out of the lab and into applications. With more work the device may become well suited for applications like sensitive colour-based detection, efficient medical diagnosis and single molecule detection.